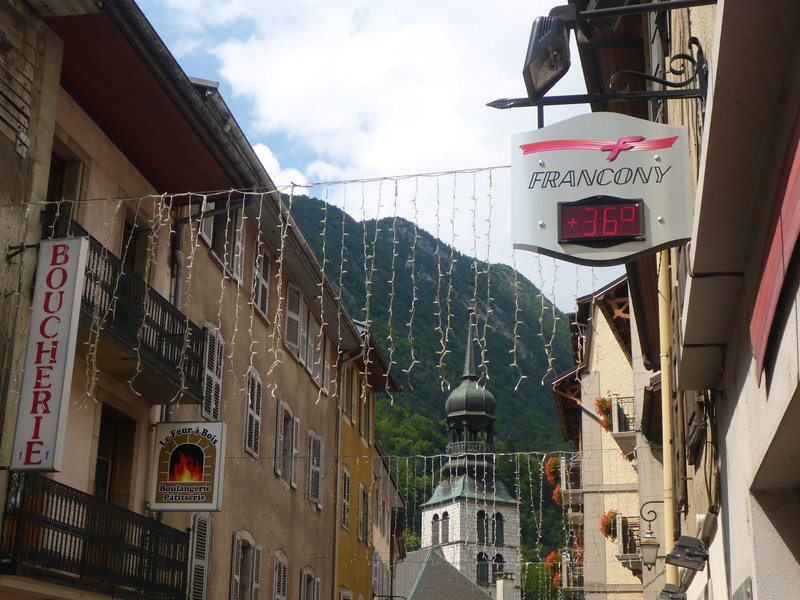 After leaving the wonderful shores of Annecy we drove into the mountains to the nearby town of Thônes. We found a space in the town’s free aire, then walked around town and looked in their shops, before getting a bottle open and chilling in the warm evening sun. It was 36 degs this day, and we were already missing the cooling breeze of the blue lake. We had a slow riverside walk later, when the sun had finally disappeared below the peaks, offering us respite. The next morning was market day, and we awoke to find the allegedly dedicated motorhome aire was over-ran with badly parked cars at all angles, blocking the road and a lot of other vans in. Thankfully we were able to squeeze out and be on our way, leaving several cars to salivate over the additional space we had freed up for them. 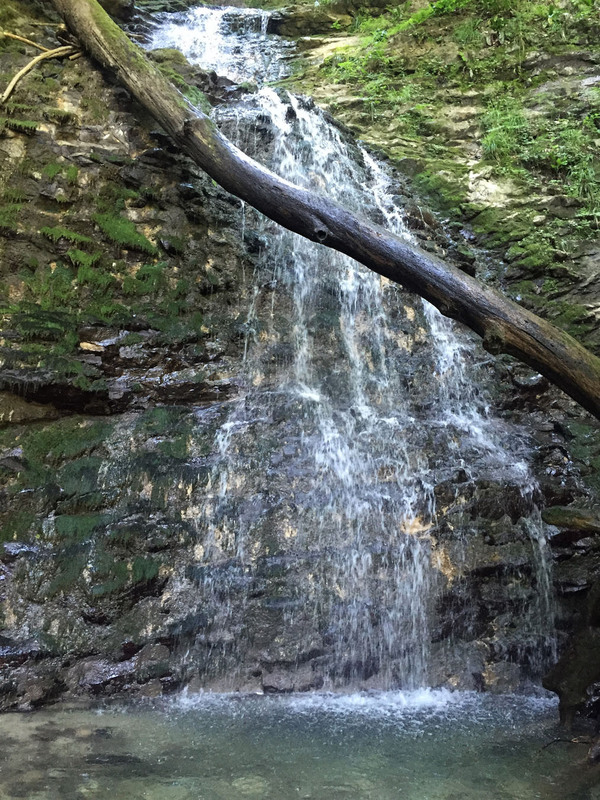 We had read a little on the Cascade de la Belle Inconnue, a short hike to a local waterfall spot with a dipping pool, and decided to investigate. After a few false starts we found the entirely unmarked path and climbed up the steep forest trail, difficult and awkwardly crossing fallen trees and scrambling up pine-needle coated tracks, only to find the feature pool was clogged with fallen trees and debris, like a wild storm had recently ravaged it. A lower, smaller pool was clear so we had a very refreshing skinny dip under the chilly waterfall to cool off before returning back to Benny. Originally we planned to stop at the top of the Col des Aravis, but it was so busy and rammed full with other vans that we kept on moving. 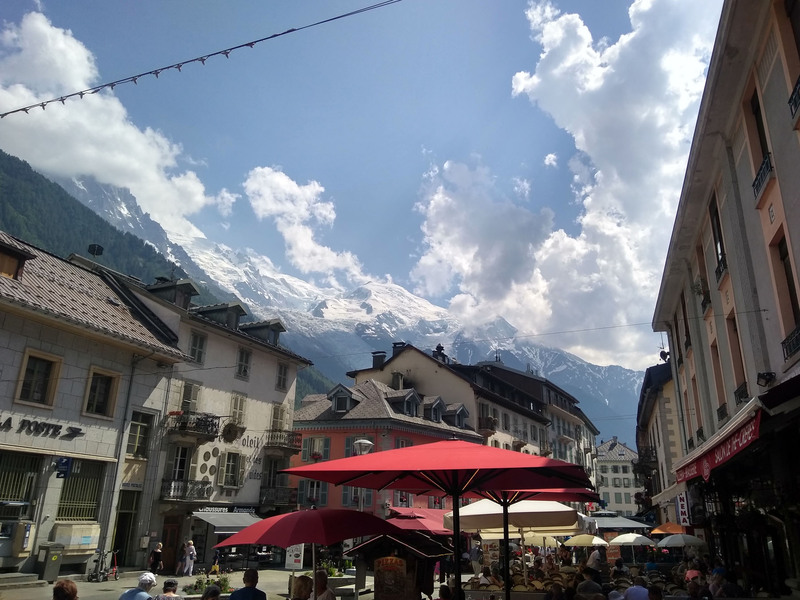 We stopped for a bite of lunch in a glamorous Casino Hypermarket car-park in Megève, but the expected services there were not in service, so we had to move on to search for others. 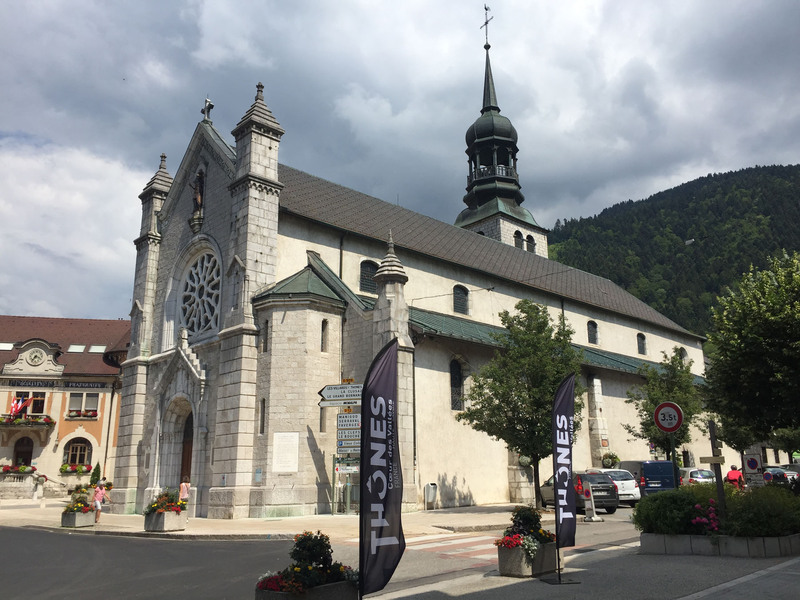 We arrived in the next main town, Saint-Gervais-les-Bains, where we found the aire, a long thin car-park behind the ice rink, perfect for motorhomes. We were parked quietly out of the way, surrounded by high trees offering some shade, yet it was an easy walk into the town. We doodled down the road, drained in the heat, where we saw a large wedding party all dressed to kill in the central church square, and visited lots of shops so we could benefit from their cooling air-con. Later the France vs Argentina World Cup match was on in a local bar, creating lots of yelling, gnashing of teeth and intrigue as the goals flew in. “Don’t cry 4-3 Argentina”. We passed another quiet evening, snuggled into the foothills of the mighty Alps. 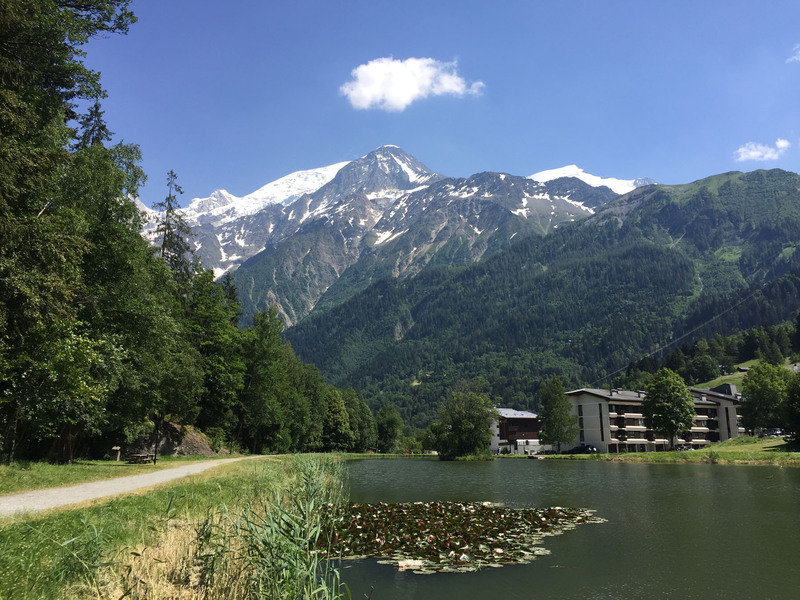 The next morning we made the short hop up the valley to the town of Les Houches, where we parked up in the free aire by Lac des Chavants, in the shadow of Mont Blanc. We were deliberately moving slowly, biding our time until the start of our next mini-adventure. 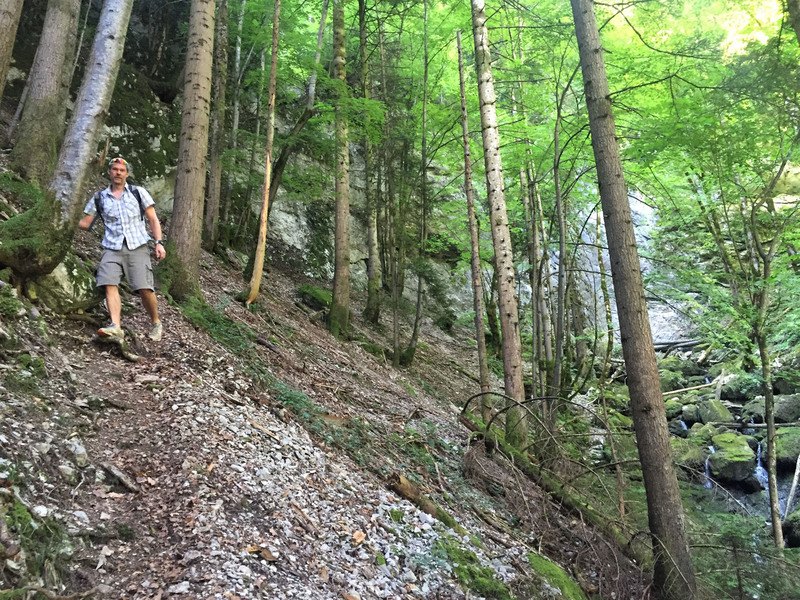 We walked into the centre of town and back, pausing only to buy new trekking poles, before spending the rest of the afternoon resting in the shade of the light woodland surrounding the lake. It was incredibly hot, and felt strange to be looking at glaciers and snowy peaks in such heat. 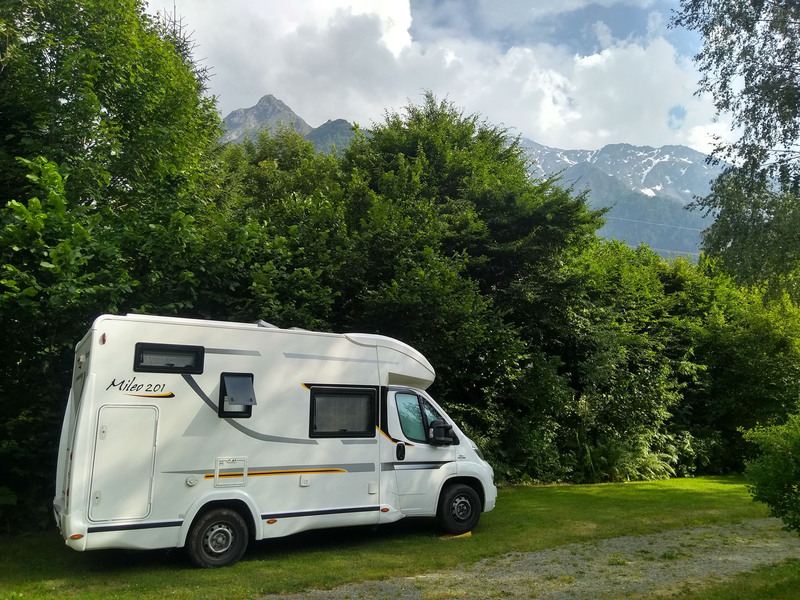 After one quiet but sticky hot night, we left the free aire at Les Houches and moved only a few kilometres up the road, to settle into a small campsite set on a grassy slope midway between Les Houches and Chamonix – Camping Le Grand Champ. We had a reservation here for a few nights, and had arranged to be able to store Benny for eleven further days, for a nominal fee, whilst we disappeared into the mountains. The glacial views walking into the site were incredible, but we picked out a shaded pitch with no mountain view, deciding that staying cool was more important. We would be seeing quite enough of the jagged, snowy peaks in the coming days, so could forego it for now. We chatted to the amenable owner and she suggested we didn’t need to move Benny to storage, but could remain on the pitch as it was unlikely to be used. Perfect for us, and would prove much less hassle on our return. 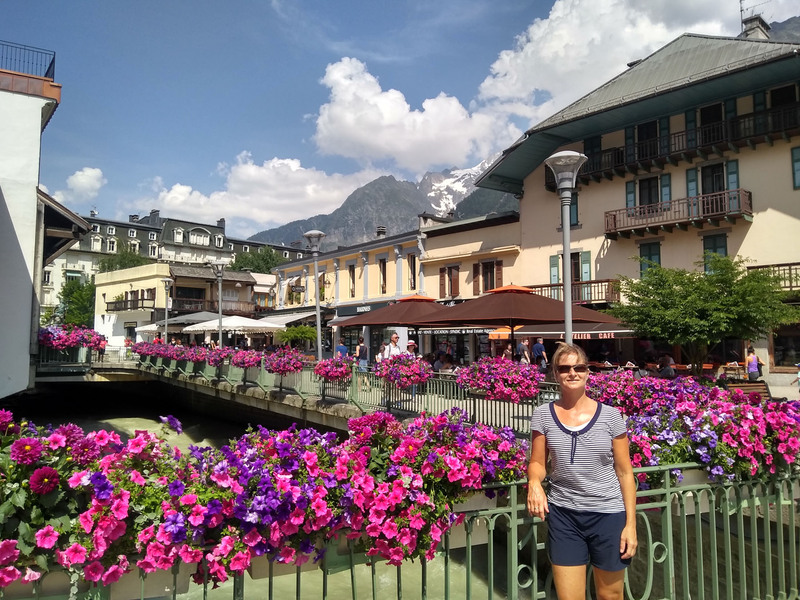 The reason the injury sustained to Nicky’s ankle on Puy de Sancy was so concerning to us was that it happened just over a week before we were due to begin our summer main event – the Tour of Mont Blanc hike, or TMB as it is commonly known. We had spent a good portion of our rainy downtime in Cazeneuve, last winter, pulling the trip together. 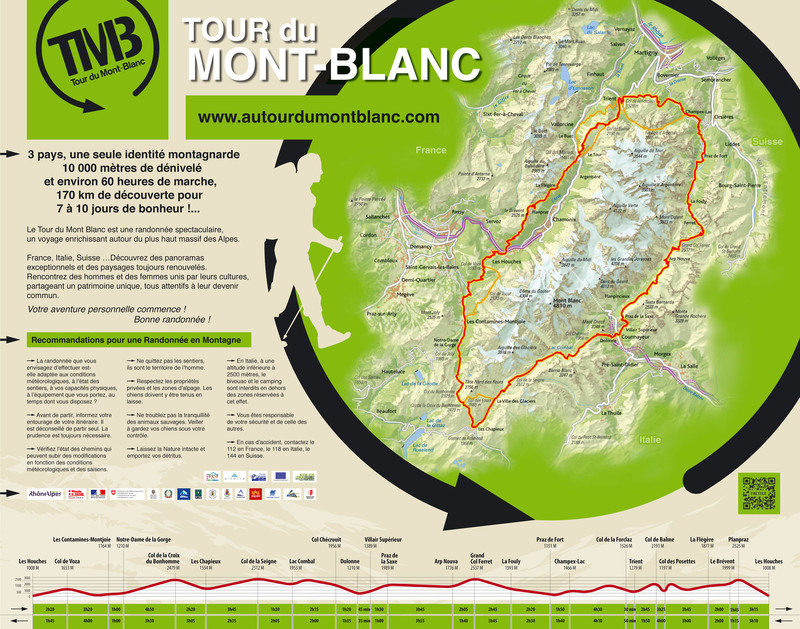 It is a 170km circular walk with the Mont Blanc Massif at its centre, passing through France, Italy and Switzerland. Distance-wise, it is roughly equivalent to walking a full loop of the M25, the concrete ring road around London. But apart from the addition of magnificent mountain scenery, the difference is that the elevation change over the TMB route, up and down, is more than the height of Mount Everest. In fact there will be over 10,000m of elevation change over the circuit. It will likely be a tough, yet satisfying, and hopefully very beautiful, challenge. We have accommodation booked at each stage, generally half-board and mostly private rooms, so we are walking the trail the posh way, and self-guided throughout. We have one bag being transferred between our hotels or mountain refuges, so we only have to carry essential safety items, clothing, water and cameras in our day-packs. Everything else is taken care of, leaving us to concentrate on the walking and the views. We opted to begin our hike early in the season’s weather window, and to walk clockwise, whereas most favour an anti-clockwise loop. We will be against the flow of people, but will have a few glorious hours each day of solitude and quiet aloneness before we meet any crowds head on. The high mountain passes, several over 2500m, are still thick with snow in early July, and there has been talk that we may need crampons and ice axes, or at least spikes and poles, to pass them in safety. We are both itching to get started, to discuss the minutiae of each days hiking with Andrew and Rafael, our tour organisers at Pygmy Elephant, and learn exactly what we need to do to ensure a safe, fun and happy circumnavigation of the White Mountain. Tomorrow we meet them in Chamonix to finalise our plans, then we walk, and walk. And walk. 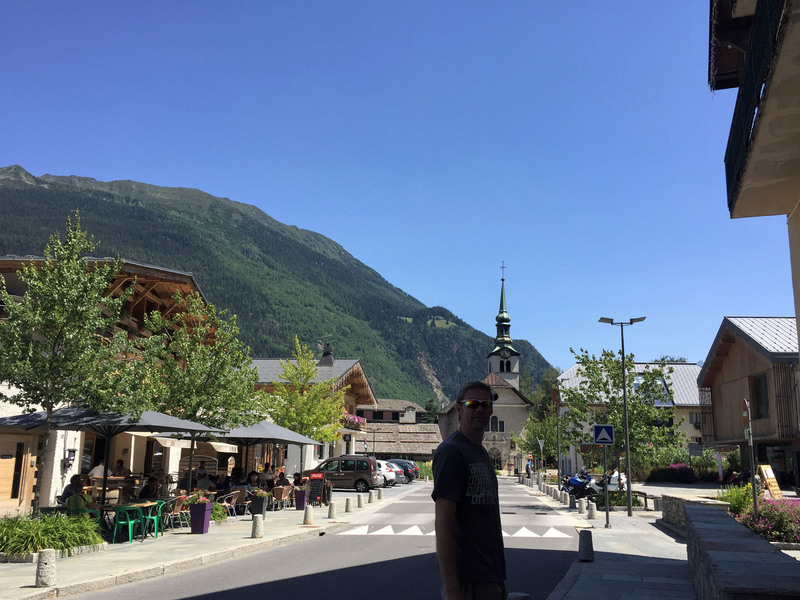 This entry was posted in 2018 Summer Tour, France, Hiking, Our Travel Journal and tagged alps, culture, Hiking, mountains, nature, planning, sports, summer, travel, walking on Jul 14, 2018 by Aaron Hill. Édith Piaf might find your alteration of ‘her’ song amusing as do I.